This collection by one of America's most gifted African American liturgical composers is a rich treasury of music for any assembly that likes to sing. Stand up, raise your hands, and sing God's praise! This collection, by one of America's most gifted African American liturgical composers, is a rich treasury of music for any assembly that likes to sing. The songbook contains simple keyboard arrangements plus guitar / vocal or "lead sheet" arrangements. Stand up, raise your hands and sing God's praise! This collection, by one of America's most gifted African American liturgical composers, is a rich treasury of music for any assembly that truly enjoys singing. 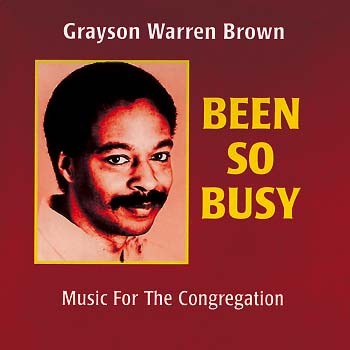 With Been So Busy, Grayson’s desire to slow things down from all of life’s busyness is apparent and honest. Many of the songs are fairly unhurried, but never boring. The leisurely pace of the rhythms allows the listener to pay closer attention to the lyrics, some based on Scripture, others, like the title track, newly written for this collection. While gospel shines through as the main musical style throughout, especially on songs such as “Lord, Now Let Thy Servant Go in Peace” and the swinging title track, others like “Sing a New Song” exhibit more of a folk style. Organ adds that special touch to the recordings on the CD, while the songbook contains simple keyboard arrangements plus guitar/vocal or "lead sheet" arrangements.